In my last post, I talked briefly about how the R.java file, a resource file located in the "gen" folder of your Android application project that is automatically generated and updated by Eclipse and serves as a resource map. My example code demonstrated how you could reference layout.xml files via the R.java file and how Eclipse would register the id of the UI objects within the R.java file as well. I also mentioned that the layout XML files for your Android app are located in a "layout" folder within the "res" ("resources") folder. There are other folders under the "res" folder as well, and the content within those folders is also registered with the R file, allowing you to access those resources within your Android code. ...and (unless I've specifically said my application will only work with a certain pixel density) Android will take care of figuring out which copy of the image file it should display. We can skip the "layout" folder since I've already talked about how to reference layout files in my previous post, so that leaves the "values" folder. You would reference a string resource much as you would a color resource, using "@string/app_name" as an attribute value in your layout XML or referencing the string programmatically using "R.string.app_name". To reference a string array, however, you'd use "R.array", as in "R.array.priority_choices", in your Android code (I'm not sure if there's a scenario in which you could reference a string array in your layout). Finally, there's one more type of resource you can define in an XML file in the "values" directory: styles. I haven't used styles in any of my Android projects yet, but according to the "Applying Styles and Themes" page on the Android developer website, you can create a <style> block in XML that sets values for various visual attributes of view objects (size, typeface, font size, etc.) 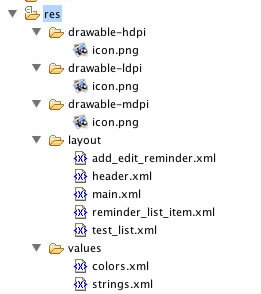 and then apply that entire set of attributes to a view object in your layout.